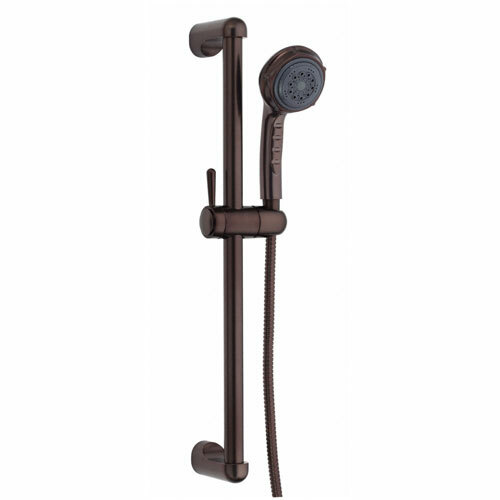 Danze Oil Rubbed Bronze 3 Function Hand Held Shower Head Kit w/ Slide Bar: This Danze Hand Held Shower with Slidebar is built to last. The highest quality standards are used to precision manufacturer a top of the line fixture. Important features of this 100% BRAND NEW Fixture: Complete Item! Everything necessary for installation is included. Oil Rubbed Bronze Handheld Showerhead w Slide Bar - 3 Function 24" Slide Bar Assembly - To make the buying decision quick and easy, Danze has thoughtfully designed handShower kits with everything you need for a great Shower experience. Consider the three-function 24 in. slide bar assembly handShower kit. Installation is quick and easy. - 3 function handShower lets you select between wide, centerjet and aeration to best fit your preferences - 2.5 gal per minute flow rate will provide steady water flow - Oil Rubbed Bronze premier finish designed to resist fading and tarnishing. - Oil rubbed bronze finish will look great in your bathroom - Matches perfectly with any Danze product to complete your bathroom - Matching Accessories Available - Easy to Install - Installation instructions included. This fixture is manufactured by Danze and is part of their Hand Held Shower with Slidebar collection. To make the buying decision quick and easy, Danze has thoughtfully designed handShower kits with everything you need for a great Shower experience. Consider the three-function 24 in. slide bar assembly handShower kit. Installation is quick and easy.